This is our 3D printed case for the Adafruit Feather. It’s for anyone looking to put their project in a box. It’s a multipurpose enclosure, so you can use it for a number of different projects. It’s designed to house different battery sizes, so it’s nice and portable. The enclosure itself is made up of three different pieces that all snap fit together. Each part has different versions, so you can make it better fit your project and there’s no wrong way to configured it. 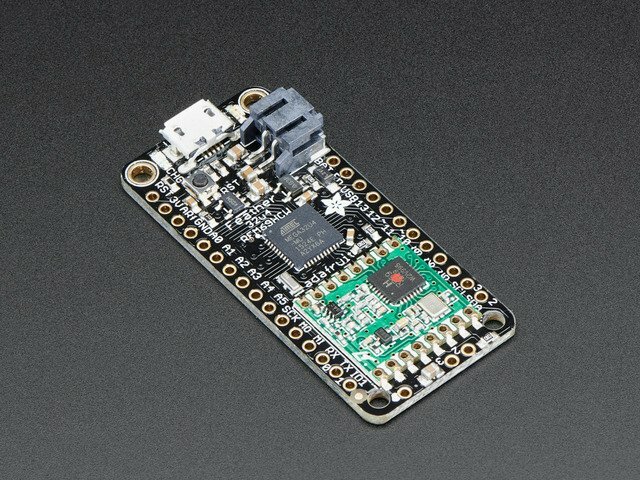 Now we have a special version of the Feather Box for the 2.4" TFT Feather Wing – Sweet! 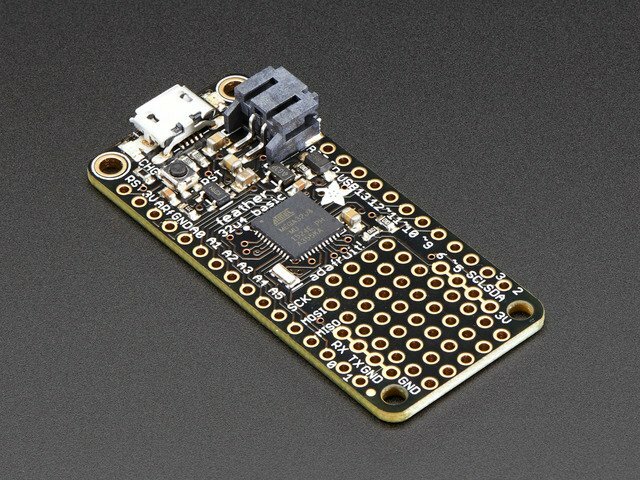 This comes in two version, one exposes the Adafruit Feather, and the other covers it all up. The topper features a cutout for the display. Here are some parts you may need to 3D print your Adafruit Feather Case. Some of them are optional, so you'll have to base the parts by your choose of components. If you are planning to use the integrated on/off switch, we suggest walking through the JST switch adapter guide. It'll walk you through all the necessary steps to build your own. It's really easy to make parametric adjustments by simply updating a user paramater. We took advantage of user parameters in Fusion 360 so you can easily make changes without having to edit a sketch and update dimensions. It's parametrically driven, so design features will automatically update. Below are the available user parameters. This parameter allows you to change the overall tolerances of all of the areas that snap fit. It's set to 0.3mm by default. You can adjust the overall length of the case by increasing or lowering this value. By default the case is set to be 68mm long. Need it to be taller? Or maybe you want it to be as slim as possible. Adjust this value change the height of the case. More of an extra, you can make the case thinner or thicker. It's 1.5mm thick by default. Want bigger/smaller mounting holes? Lower/increase this value to adjust the overall diameter of the mount tab holes. PLA is our filament of choose and a great option for people just getting into 3D Printing. Other materials such as ABS, Nylon, PETG might produce different tolerances, so be aware of that if the parts don't fit exactly. You'll need to slice the parts using a profile made for your 3D printer. You can use free software such as CURA to slice your parts. We recommend using a slicing profile that works for your specific type of 3D printer. Below are some suggested slice settings. It's important to thoroughly check your slicers tool path. Most slices have a visual "layers" mode to see the individual layers and movement of the tool head. Step through the layers and inspect how the walls/perimeters will be printed. You should have a solid 3-wall count. If there's a noticable gap between the inner/outer walls, you may need to adjust your slice settings until it produces a 3 perimeters. In Simplify3D, the desired setting is under Advanced > Thin Wall Behavior > Allowed perimeter overlap: 50%. It's important to set the slice settings so that the walls are printed with 3 perimeters. This gives the part rigidity and provides a clean tool path. This does not relate to the "Outline/Perimeter Shells" that should be set to 2 (referred to Wall Line Count in CURA). The thickness of the walls ought to provide 3 solid perimeters. You'll have to adjust the Extrusion Width (referred to as Line Width in CURA) in order to produce 3 perimeters. Getting a good first layer is crucial for succesfully printing the parts. It's also important to have good bed adhesion to avoid warped corners. Depending on your 3D printer, you'll may or may not have a heated bed. You might use blue painters tape but I suggest using a printing surface such as a PrintInZ skin. This subtrate is great for non-heated bed and offers really great bed adhesion to minimize warping. You can now use the TFT Feather Wing in your 3D printed feather box. 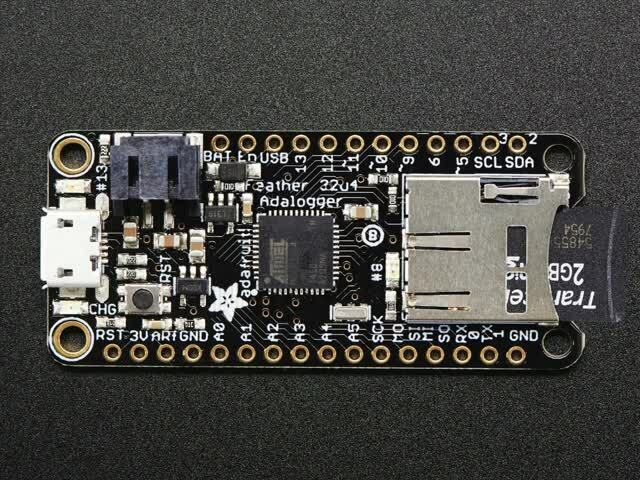 This is a great way to make a portable project with a 2.4" TFT display. 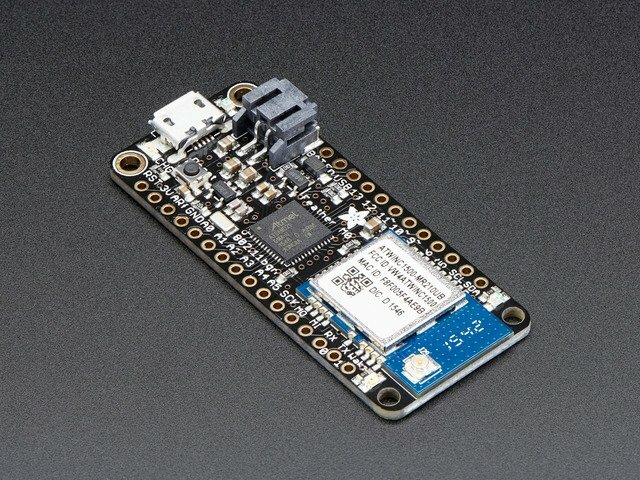 You'll need an Adafruit Feather, the TFT Feather Wing, and a 500mAh battery (optional). Please make sure you've walked through the TFT Feather Wing tutorial before assembling this project – That guide will show you how to install header pins on the header, explains pinouts and software setup. The enclosure is slightly different than the Feather Box. It's larger because it needs to enclose the entire display and PCB. The topper has a perfect cutout for the display and features the same "snap-fit" functionally – Just press it down on top of the enclosure to install it. The display requires M2.5 machine screws to secure the PCB to the topper. The case comes in two different versions, one that exposes the Adafruit Feather and the other fully encloses it. Start by laying the PCB over the topper with the display facing down and the topper facing up with the standoffs visible. Orient the display so the cutout is lined up with the screen. The cutout should only expose the viewing area and not any black borders. Line up the mounting holes on the PCB with the holes on the standoffs of the topper. The holes in the standoffs are ~2.5mm in diameter and ~4mm deep. Install and fasten a 2.5M 4mm size machine screws into each mounting hole. Hold PCB up against topper and keep it flush while fastening screws. Check PCB to ensure the TFT display is fully secured to the topper. Flip it over and double check the screen cutout is still properly oriented. Now it's time to install the Adafruit Feather onto the TFT Feather Wing. Before we install it, we need to make sure the short header pins are installed on the bottom of the Feather. If you have regular header pins, use wire cutters to trim them short. Start by orienting the board so the pins line up. Then, lay the board over the female headers and guide the pins into the holes. Press board down until pins are fully seated. The two plastic pieces from headers should be flush with each other. If you'd like to use a slide switch to power your project on/off, then you'll need to wire up your own. This one is a bit special because the ends of each wire have short right angle header pins – These can easily plug into the second pair of female headers on the back of the TFT Feather Wing. Use the enable and ground pins to power off the circuit. Battery recharging will still be functional. Insert the two wires from the slide switch in between the Adafruit Feather and TFT display – Going through the side with the USB port. Pull the wires through the other end. This will allow us to connect the slide switch to the TFT display without too much excess wiring. Now we can connect the wires from the slide switch to the female headers on the TFT. Plug in one wire to the enable pin and the other to the ground pin. Note: If the header pins from the switch are too tall, you won't be able to close the case. So, make sure they're low-profile! Next, we'll insert the cable from the 500mAh battery through the opposite side of the feather. Pull the cable through until it's about half way. 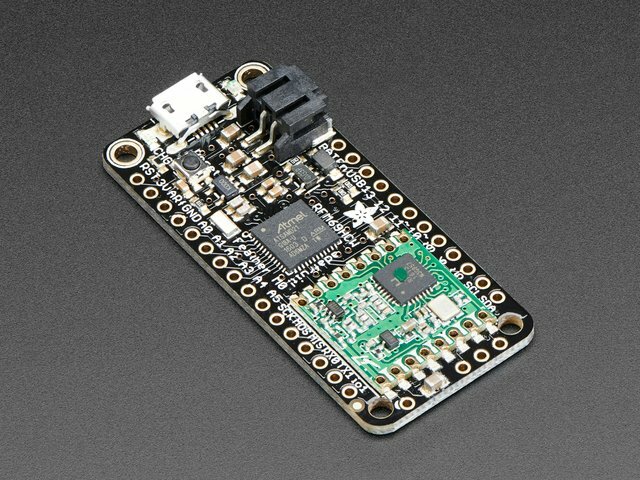 Now we can plug in the male JST connector from the 500mAh battery to the female JST connector on the Adafruit Feather. You can secure the battery to the back of the TFT Feather wing using a blob of mounting tack. Stick it on the battery and place it on an area away from the on-board reset button and on/off switch. Now our TFT is secured to the topper! Next, we'll work on installing the slide switch (optional) and closing it all up! Next, we'll work on securing the slide switch to the case. Insert the body of the slide switch at an angle into the three walls inside the case – These will hold the slide switch in pace. The actuator from the slide switch will stick out slightly from the side of the case. OK! Now it's time to close it all up. Orient the case so the the cutouts line up in the appropriate spots (microUSB and SD card slot). Then, insert the topper over the top of the case. Press the two parts together until they snap together. Make sure all of the wires all contained within the case! You don't want any of them to get kinked. Alright, looks like we're all done. Give it a try, test to see if everything works. If you installed the switch, turn it on! Test out battery charging, see if your USB cables connect properly. 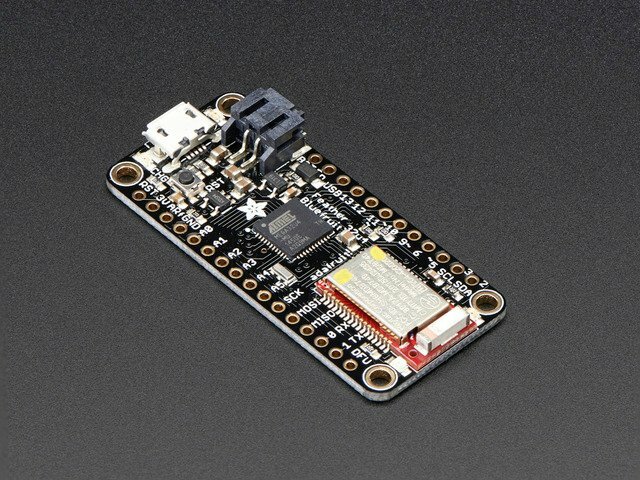 If you're interested turning your TFT Feather Wing into weather station, you can check out the project linked below. 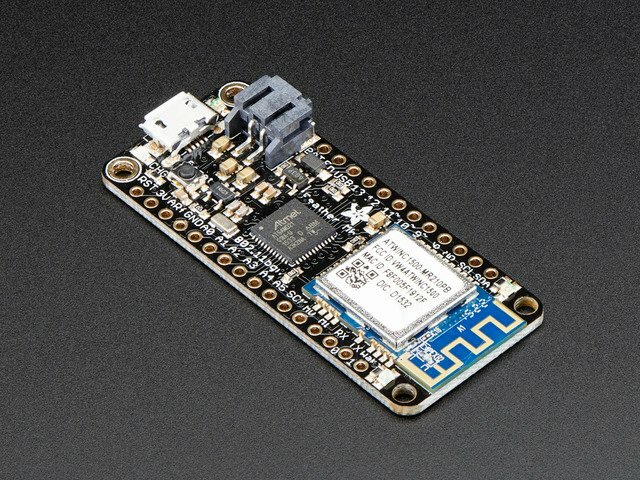 Use the Adafruit Feather HUZZAH with ESP8266 WiFi and awesome software by Squix! This guide was first published on Mar 29, 2017. It was last updated on Mar 29, 2017.